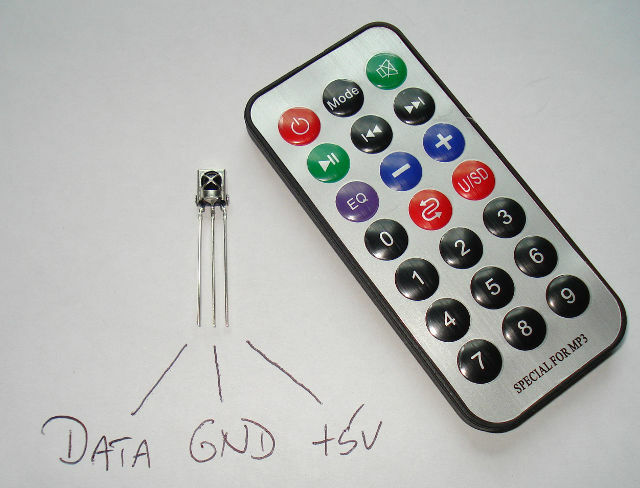 This is the infra red receiver, with the pin connections and the remote control. I found an excellent infra red project description at this webpage. This project was especially interesting because it led me to the software 'Processing'. This had appeared in my software packages within the 'arduino' group (I'm on linux, remember), and I had installed it and looked it up on google. But I had never used it before. See later on. The code also uses the arduino pulseIn() function, which was a new one to me. The infra red receiver can be very easy to get results from; simply plug in the 3 pins to your arduino, and run the basic code below. The output from the infra red receiver appears in the serial window. Other people have created libraries to interface with the IR receiver, see here. I followed the steps from that project, and here is my wiring and the code from his project below. Wired up - so simple yet so effective with the code. Open the serial monitor, and the codes appear that correspond to the button you pressed. And now the part that was new to me, the software 'processing'. Assuming you've downloaded it and installed it: On my linux system, I downloaded it and ran it from my downloads directory. 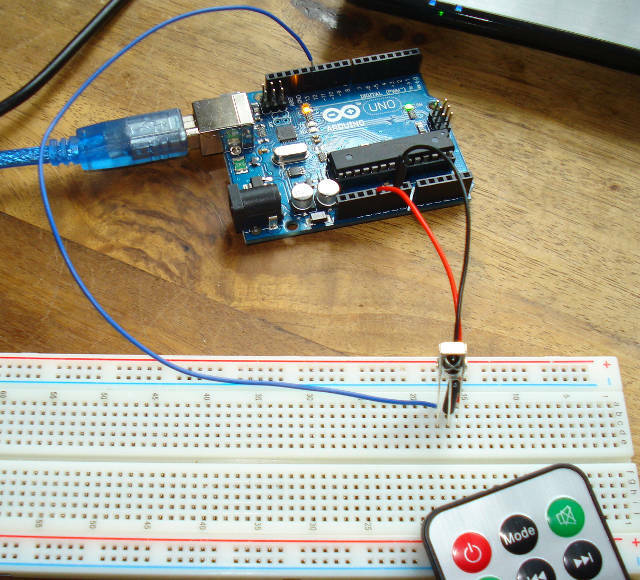 Exit your arduino IDE, to release any locks on the USB port. 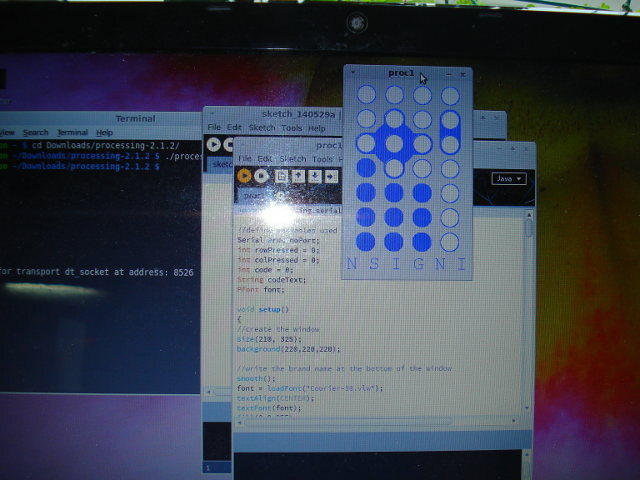 What the code does, is display a window with circles to simulate the remote control. Then, it listens on the serial port (the USB port) for the codes that are output from the arduino. (It then decodes them, and makes one of the circles flash red). The clever part, to me, was that the arduino outputs on the serial line in through the USB port. If the arduino IDE is running, and you open your serial monitor, then the output is displayed there. But if you exit the arduino IDE, and set up 'processing' to listen on the serial port, then a whole new set of possibilities opens up. Screenshot of me running 'processing', and the code below to interpret the Infra Red signals. //initialize a few things each time.